Nationals 2014 will be hosted by the NAIGC in Chattanooga, Tennessee, Thursday, April 3rd through Saturday April 5th. The event will be held at the The Chattanooga Convention Center. Reservations: 1-800-841-1674, Event name: NAIGC. Reservations must be made by March 5. *As of Mar 1st there no longer rooms available at the host hotel. There are two overflow hotels listed below this map. Studio Suites with (1) Queen Bed and (1) Queen Sleeper Sofa @ $124 per night, plus taxes. One-Bedroom Suites with (1) King Bed and (1) Queen Sleeper Sofa @ $134 per night, plus taxes. One-Bedroom Suites with (2) Full Beds and (1) Queen Sleeper Sofa @ $134 per night, plus taxes. For reservations, your guests can call 423-267-0900 or 800-238-8000 and simply refer to the block of rooms for NAIGC. For general information about how to get around Chattanooga click here. The closest airport is the Chattanooga Metropolitan Airport â€“ CHA, which is about a 15 minutes drive from the hotel and convention center. The best way to get from the airport to the hotel and convention center is by taxi. It will cost about $20-$30 for a group of 4 people. $25 from airport/hotel for car or van, additional passengers no extra cost. For information about taxis and rental cars in Chattanooga click here. There is a free Downtown Shuttle Service that provides transportation to most areas within downtown Chattanooga area. A map of the shuttle routes is available here. You can rent a bike through Bike Chattanooga for just $20 while you're in town. Itâ€™s a great transportation option if your team doesn't have a car, or if you just want to explore! Self-parking will be available in the parking garage attached to the host hotel, the Chattanooga Downtown Marriott, for $10.00 plus tax per day. Valet is available for $14.00 plus tax per day. Both options include 24 hour in/out privileges. All full members will receive a free pair of NAIGC sweatpants. Nationals 2014 fees include individual registration fees, and team fees if competing as a team. These fees are in addition to the NAIGC membership fees (described above). Each club must pay an individual fee for each individual competitor, as well as a team fee for each team that is entered into the team competition. $75 for early bird registration paid / postmarked by February 1, 2014. $85 for regular registration paid / postmarked between February 1 and March 1, 2014. $110 for late registration paid / postmarked after March 1, 2014. ** If you do not pay by March 20, you are not guaranteed entry into the competition. $100 paid / postmarked by March 1, 2014. $125 paid / postmarked after March 1, 2014. $25 per person paid / bought prior to Nationals. $30 per person paid / bought in-person at Nationals. The Nationals 2014 waiver is required from each individual competitor, coach, and volunteer. You must have a NAIGC username and password to access the waiver. Each individual must sign the electronic waiver themselves. After you sign the waiver, this part of your registration will be marked as completed. The waiver link will be available as nationals approaches. The following policy outlines the rules and division structure that will be used and enforced for all NAIGC National Championship competitions. 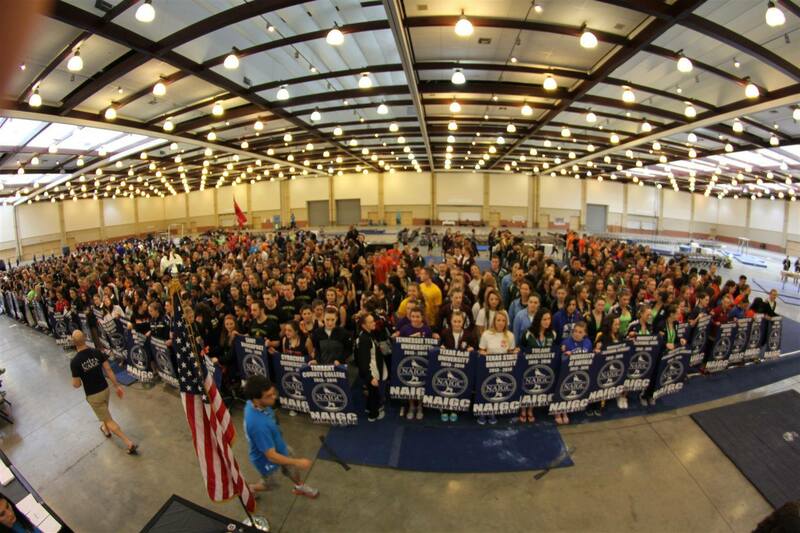 For Nationals 2014 in Chattanooga, both the Men's and Women's competition will have a Competitive Division. In addition, there will be an Open Division for Women's competition only. For both men's and women's competition there may be an Open Division in addition to the Competitive Division. The Open session(s) will be implemented at the discretion of the NAIGC based off of registration and financial feasibility. In the event that the NAIGC cancels the Open Division, all Open registrants will be automatically registered into the Competitive Division. All men's sessions will be conducted in warm up-compete style. In preliminary sessions, women's team scores are determined by summing the four highest scores on each event. Registration fees (individual and team) will be the same for both divisions. Including men and women, Open and Competitive, the maximum total number of sessions is 12 sessions. Within one gender and one division, there can be no more than 6 sessions (for judging consistency). In the event that registration exceeds either of these constraints, spots will be determined on a "first come, first served" basis. Judging rules will be the same for both divisions. There will be individual and team awards for both divisions. Overall Structure: A club can enter one or more teams in each division. Each individual gymnast (whether part of a club or competing as an individual) can select to compete in one, and only one division, either Competitive or Open. Competitive: The general structure for advancement to finals and awards is outlined in Section 11. Open: The Open Division will only have preliminary sessions and no finals session. Equipment: All sessions in a specific division will compete on the same set of equipment. Equipment assignments to divisions will be made based on registration and determined in the best interest of the NAIGC (i.e., sharing equipment amongst genders and divisions when possible). Competitive: The Competitive Division will have 2-judge panels and all Competitive sessions will be judged by the same panels. Open: The Open Division will have 1-judge panels and all Open sessions will be judged by the same panels. Mercy Rule: If a club does not have at least one gymnast from each gender competition qualify into finals (event, all around, or team finals), the club may choose one member from each gender competition to participate in finals on one event of their choice. If a club has multiple teams per gender competition, they may choose to pay additional team fees to ensure that additional teams (i.e. team B) can also have one person qualify for the Mercy Rule. Competitive: Mercy rule competitors who competed in the Competitive Division will be judged during finals competition but will not be eligible for an award. Open: Mercy rule competitors who competed in the Open Division will not be judged or be eligible for an award, but can do an exhibition routine. Competitive: Awards (team and individual) will be determined based on scores during the finals session. The awards for the Competitive Division will be distributed at the banquet Saturday evening. Only scores from individuals registered in the Competitive Division will count towards Competitive Division individual and team awards. See section 11.h. for specific rules regarding Competitive Division awards. Open: Awards (team and individual) will be determined based on combining scores from all preliminary Open Division sessions. The awards for the Open Division will be distributed after march-in at Finals. Only scores from individuals registered in the Open Division will count towards Open Division individual and team awards. Team awards will be given to the top three women's teams and top three men's teams (if Open Division is offered for that gendered competition). All-around awards will be given to the top ten women's all-around scores and top ten men's all-around scores (if Open Division is offered for that gendered competition). Event awards will be given to the top ten individuals on each women's event and the top ten individuals on each men's event (if Open Division is offered for that gendered competition). The Competitive Division at Nationals will have multiple preliminary sessions, and one finals session. The one highest-scoring team from each of the women's preliminary sessions will automatically qualify for the women's team finals. In addition, women's teams placing in the top eight among all sessions combined will qualify. The one highest-scoring team from each of the men's preliminary sessions will automatically qualify for the men's team finals. In addition, men's teams placing in the top six among all sessions combined will qualify for team finals. The two highest-scoring all-around competitors from each session will automatically qualify for women's all-around finals. The three highest-scoring all-around competitors from each session will automatically qualify for men's all-around finals. For each event, the two highest-scoring individuals from each session will automatically qualify for women's event finals in that event. For each event, the three highest-scoring individuals from each session will automatically qualify for men's event finals in that event. To be eligible for an event award, an individual must have qualified for individual event finals on that event. Team finals participants and all-around finals participants who did not qualify for event finals during the preliminary competition on a given event are not eligible for an award on that event. Adjustments for Registration: The NAIGC Board of Directors reserves the right to change any numbers highlighted in blue without creating a new version of this policy. All changes will be announced before competition begins and posted on www.naigc.net/nationals2014.php. This policy may be amended by the NAIGC Board of Directors as needed. Current session assignments are displayed in the following tables. The tables can be sorted in various ways by clicking on the ^ symbol next to a column header. What to do in Chattanooga? Our top 10 picks for members. 1. Ruby Falls â€“ A 65-foot-high underground waterfall inside Lookout Mountain. And Ruby Falls Zipstream - An aerial obstacle course with ladders, nets, bridges, walkways, tunnels, and of course, zip lines! Where? 4 miles from convention center. Where? 1 mile from convention center. On free shuttle line. Cost? $20-30. Group rates available for groups of 10 or more. Where? 1 mile from convention center. Stretches for 10 miles. 4. Bluff View Art District â€“ Lots of restaurants, shops, cafes, and public art. Where? 1.5 miles from convention center. Cost? Free to walk around. $$ for dining options. 5. North Shore â€“ A trendy shopping district with restaurants and parks. Cost? Free to walk around. Dining and shopping options. 6. Tennessee Valley Railroad Museum â€“ Historic steam train rides. Where? 10 miles from convention center. Cost? $17 for an hour long historic train ride. 7. Hunter Museum of American Art â€“ American art from the colonial period through today. 8. Battles for Chattanooga â€“ A Civil War museum and interactive 3D map of Civil War battles fought in Chattanooga. Where? 7 miles from convention center. Via lookout mountain scenic highway. Cost? $8. Or $5.50/person with groups of 15 or more. 9. Chattanooga Choo Choo â€“ Home to restaurants, retail shops, rose gardens, and a model railroad museum. Where? 1 mile from convention center. Cost? Free. Dining and shopping options. 10. The Incline Railway â€“ Ride a trolley car up one of the worldâ€™s steepest passenger railways. Enzoâ€™s Market: 1501 Long St. Chattanooga, TN. 0.7 miles from Convention Center. Buehlerâ€™s Food Market: 429 Market St. Chattanooga, TN. 1 mile from Convention Center. Whole Foods: 301 Manufacturers Rd. Chattanooga, TN. 1.5 miles from Convention Center. Rite Aid: 3401 S. Broad St. Chattanooga, TN. 2 miles from Convention Center. CVS: 1 Cameron Hill Cir. Chattanooga, TN. 1 mile from Convention Center. Walgreens: 110 N. Market St. Chattanooga, TN. 1.5 miles from Convention Center. Downtown Amoco Service Center: 1725 S. Market St. Chattanooga, TN. 1 mile from Convention Center. Mr. Zip Inc of Tenn: 305 Frazier Ave. Chattanooga, TN. 1.5 miles from Convention Center. Racetrac Petroleum Inc. 2720 Rossville Blvd. Chattanooga, TN. 3 miles from Convention Center. A printable checklist for nationals can be found at this link, which details a list of things you need to do to be set up for nationals. For any other information, check the FAQ below. What are the differences between the Open and Competitive Divisions? The one highest-scoring team from each of the women's â€œCompetitive Divisionâ€ preliminary sessions will qualify for the women's team finals. In addition, women's â€œCompetitive Divisionâ€ teams placing in the top 8 among all sessions combined will qualify. To be eligible as a team member in team finals, an individual must have participated for that team in the preliminary â€œCompetitive Divisionâ€ competition. The one highest-scoring team from each of the men's preliminary sessions will qualify for the men's team finals. The three highest-scoring all-around competitors from each â€œCompetitive Divisionâ€ session will qualify for women's all-around finals. In addition, all-around competitors placing in the top 20 from among all â€œCompetitive Divisionâ€ sessions combined will qualify. For each event, the three highest-scoring individuals from each â€œCompetitive Divisionâ€ session will qualify for women's event finals in that event. In addition, event â€œCompetitive Divisionâ€ competitors placing in the top 20 from among all sessions combined will qualify. To book rooms using the hotel block, call the Marriott Chattanooga at the Convention Center at (423) 756-0002 and identify yourself as members of NAIGC. You can also book online here. No, NAIGC does not provide transportation to and from the airport. Please check the Nationals 2014 page for up to date information on public transit options from the airport to the hotel. Many teams find Nationals a good time to both bond with their teammates and meet gymnasts from other schools at the host hotel after competition has ended for the day. There are also a lot of restaurants and local attractions in the area. On Saturday evening, there is an Awards Banquet and dance that all participants attend. Please check the Nationals 2014 page for up to date information on local restaurants and attractions close to the host hotel and competition venue. What type of equipment will be at the event? All equipment at Nationals will be AAI. What is the competition format? Is it capital cup? How long do we get for timed warm-up? Do we get a touch? All women's sessions will be conducted in capital cup style. Women competitors will have 2 minutes per gymnast per event for warm-up and no touch will be allotted if warming up and competing on the same equipment. If gymnast warm up and compete on different equipment a 30 second touch will be allotted to each gymnast. All men's sessions will be conducted in warm-up/compete format. What judging rules are used at Nationals? Women will be judged using JO skill values and level 9 requirements. D's and E's will not be limited. Level 9 and 10 bonus is used to the advantage of the gymnast. D's and E's will be given additive value of .1 and .2 respectively and recognized in connection value.Men will be judged using 2013 FIG Code of Points and JO Level 9 rules for all events except on vault; on vault, men will be judged using the 2013 Code of Points and Level 10 rules with a modified vault bonus table.NAIGC will not, however, be adopting any of the JO skill restrictions (e.g., prohibition on roll-out skills on floor, limitations on Li Ning, Guczochy, and Honma-type skills on rings, etc.) and will instead follow the 2013 FID Code of Points on those skills.Additional note: Yurchenko-style vaults will be allowed for both men and women. A safety collar and hand placement mat will be provided. Please do not create duplicate profilesi: for username and / or password help, simply email info@naicg.net. There is also a feature on the website to retrieve your password automatically via email. In order to register your team for Nationals on the website, your club's admin needs to go to meet registration page and click on the Register button next to Nationals. From here you can Manage Individuals (register members from your roster for nationals) and Manage Teams (designate members who are now registered for Nationals to specific teams). This is also where you can designate members t-shirt size, order extra t-shirts, order banquet tickets, and designate who will be competing on which event. (See Nationals Checklist for more details). Yes, you can pay for Nationals either online or with a check. Paying online if preferred and can be done through the meet registration page. If you prefer to pay with a check, please complete the Nationals check submission form and mail it to the NAIGC with your check. The form and current mailing address can be found on the Nationals 2014 page. In order to see how much you owe for Nationals and if you have fully registered and paid click on the "Display Summary" button at the bottom of the meet registration page. Any item not completed or paid will be in red and/or marked "Not Received". If you have questions about anything relating to Nationals fees or payments please email the nationals@naigc.org. Yes, but only paying members are allowed on the competition floor. In order to become a member of NAIGC, your coach simply has to create a profile on the NAIGC website and designate themselves as a member of your club. The coach membership fee is $15 and can be paid from their or your club admins membership page.